Some Windows users like to see even the used hard disk space on a sheet of paper! MeinPlatz has a very good print and print preview function. For the column selection, width and position, the view to be printed is taken proportionally 1 to 1. The aspect ratio (scaling) in the print preview can be changed in order to read and place much possible on data on one paper page. Likewise, set the page margins individually in the print preview. Info: The setting of the margins, selected printer and landscape format are saved when leaving the print preview. However, it was just a nice suggestion from a user who likes to document everything on paper (to archive). Please always use ► ... the latest version of the portable free storage analyzing software! (Image-1) Folder Printout of the used hard disk space for Windows? However, it is up to you whether you want to use the print function or not. It was just a nice suggestion from a user who likes to document everything on paper. Very good folder export function for Windows! You often need to print and export the contents of your directories (folders) in PDF or HTML files! With My Place you can easily cover everything on your hard drive, print or export a list of files in various formats. All this happens quickly and easily with the help of an intuitive interface! If you have a movie collection, the program will create for you a list of all video files with the size and date of creation of each file. It will be a simple list or directory structure with subdirectories and files. You simply select the folder with the files and the Windows Tool does the rest! 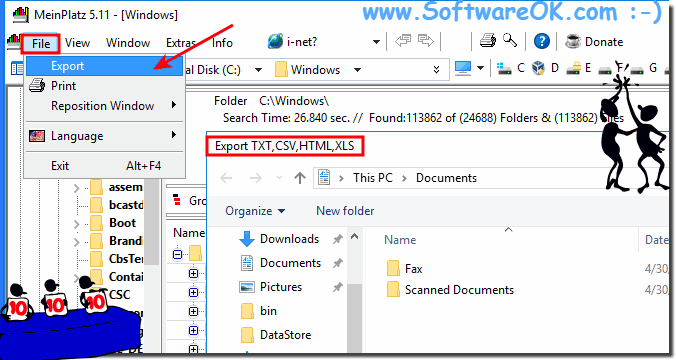 (Image-2) Folder-Tree of the Windows file system export to XLS or HTML! MeinPlatz - FAQ-6: Why print out the lost space on the hard disk for Windows? Some users like to see even the consumed memory on the hard disk on a piece of paper! My location has a very good print and print preview function. The column selection, width, and position is proportional to 1 to 1 from the view you want to print. The aspect ratio (scaling) in the print preview can be changed to place and print as much data as possible on a page. The page margins can also be set individually in the print preview. The setting of the margins, selected printer, and landscape format are saved when you exit the print preview.However, it is up to each individual to decide whether to use the print function or not.